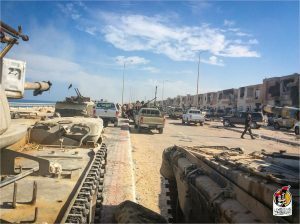 At least eight more fighters with Bunyan Marsous have been killed in the last 24 hours as house by house, IS fighters are winkled out of their last positions in Sirte. It is being said that 14 terrorists have died. One IS fighter, who claimed he was from the Gambia was captured and displayed for the cameras, as was a Tunisian woman who surrendered during the fighting on Friday. Still wearing her full face veil, the 22 year-old explained that she had been attracted to IS on social media and had made her way to Sirte via Sabratha. But once involved with them, she could not escape the terrorists. BM is serialising her story on its social media page. With the battle now contained within a small area of a few dozen properties, BM forces are moving a house at a time but are still taking casualties from booby traps and snipers. Yesterday there were five BM men killed, a number of them by rifle-launched grenades. The terrorist thought to be responsible was later cornered and shot. As Misratan-led forces spearhead the final advance, they continue to discover tunnels as well as the inter-connecting knocked-though walls. The tunnels seem to have been dug mainly as shelters from aerial strikes and artillery bombardment.